Bonsai trees are absolutely gorgeous and can be very peaceful! Check out this awesome Juniper from The Soothing Company! 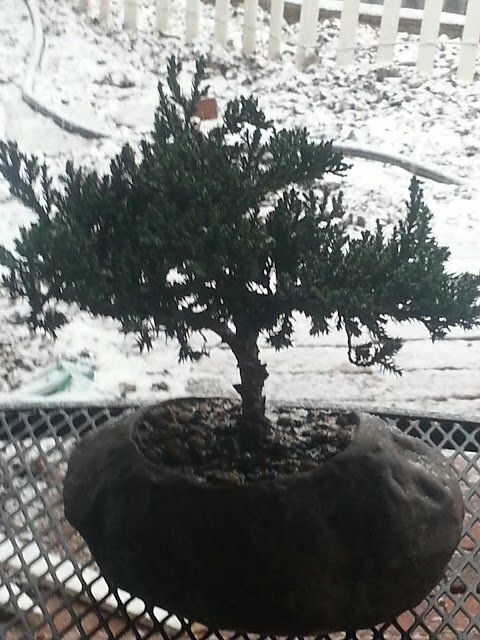 Pictured above is the 5 year old outdoor Green Mound Juniper in a rock container. Obviously, I am loving my bonsai! I have always been nervous about getting one because I was told they are hard to care for and I wasn’t interested in reading one of those big fat books to learn how to care for it. I know, lazy, don’t judge me! The Soothing Company eliminates this worry by including an easy to understand pamphlet on how to care for your tree. Obvious, HUGE plus for all of us! Takes the difficulty out of it! In addition to being able to contact them for help and support in caring for your tree, you can get all of the tools you need to care for your Bonsai on their site! The other factor that kept me from buying one in the past was the cost. On occasion, there are people on the side of the road here that set up and sell them. Unfortunately, the price range is from $80 to up to $400 bucks! Umm, yeah…. can’t afford that one! This Juniper, at 5 years old, costs only $50!!! Also, they include free shipping and you don’t have to pay taxes! I really love my tree and have enjoyed their site a lot. I’m making my list for what I’ll be buying in the future for my home! They have so many great products, it’s almost like the who’s who of home accessories! Their site is incredibly easy to navigate so that you can find exactly what you want and I really appreciate the simplicity of the site operation. The Soothing Company offers hundreds of soothing products for your home and office. Everything from Water Fountains to hammocks to bonsai trees and modern fireplaces. You can check out their amazing water fountains here for both indoors and out! I have always wanted a bonsai tree. Glad you are enjoying yours! Hope someday to own one!